jesssa is using Smore newsletters to spread the word online. 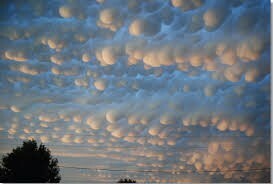 Mammatus clouds are most often associated with the anvil clouds and also severe thunderstorms. They often extend from the base of a cumulonimbus, but may also be found under altocumulus, altostratus, stratocumulus, and cirrus clouds, as well as volcanic ash clouds. Mammatus clouds mostly form after thunderstorms. 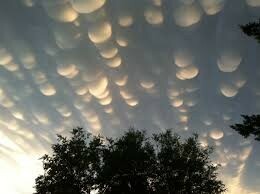 Mammatus clouds mostly form in balls after thunderstorms. People call them Cotton Balls cause the way they look. 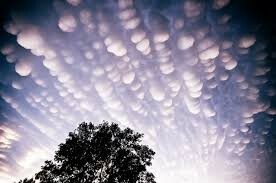 Most Mammatus clouds usually stay in straight lines with multiple balls of clouds. For a mammatus to form, the sinking air must be cooler than the air around it and have high liquid water or ice content. They derive their name from their appearance, like the bag-like sacs that hang beneath the cloud resemble cow's udders.